I don't like the winter. I live in Utah where we have lots and lots of winter. I like the snow on Christmas Eve and Christmas Day, for ambiance, and that is it! I am not one to venture out in the snow when I can avoid it, but there is one thing that I LOVE about winter, and that's all the hot chocolate! I have my favorite mug, but I also have three different hot chocolate mug sets, as well as two hot chocolate machines! There's nothing like delicious hot chocolate, in the perfect season for it! I have tried lots and lots of cocoa recipes, and below are a few of my favorites! These are fun to make as a family, little ones will love to pour the ingredients into a bag and shake it until mixed! It makes the treat of hot chocolate extra special each time you pull out the mix that you made together as well. I have also included a few recipes for hot chocolate that need to be enjoyed as soon as they are made. These are great to make for groups, if you are having family and friends over. My family always takes a big thermos of hot chocolate when we go sledding, and these recipes would be great for that as well. The powdered mixes can also make fun gifts when presented with a cute mug and a chocolate dipped spoon or candy cane to mix the cocoa with. Be sure to top your hot cocoa with marshmallows, cream, or cinnamon! Enjoy! Combine all ingredients in a large bag and shake until mixed. Store in an airtight container and store in a cool, dry place. To make one cup of cocoa, combine 1/3 C hot cocoa mix with 1 C hot water and stir. This is a fun mix, because you can change the flavor with each batch you make! A few flavor options are: hazelnut, chocolate toffee, cinnamon, French vanilla, sweet creme, almond creme, and vanilla caramel. Put all ingredients into a large bowl and mix with a big spoon, making sure to mix thoroughly. Or, put all ingredients into a large bag and shake until mixed. Store in an airtight container or divide into smaller airtight containers for gifts. To use the mix, add 1/4 C mix to a mug containing 1 C hot water and stire. If desired, add some mini marshmallows and/or a squirt of whipped cream. Make 1 1/2 C dark chocolate hot cocoa as directed on package with water or milk and set aside. In a saucepan, combine milk, pumpkin, and sugar; cook on medium heat, stirring, until steaming. Remove from heat, stir in vanilla and spice, transfer to a blender, and process for 15 seconds until foamy. 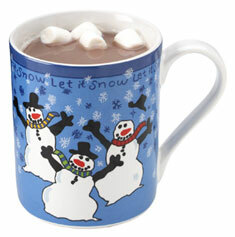 Pout into mugs and pour some of the dark chocolate hot cocoa into each mug. Top with whipped cream and a sprinkle of pumpkin spice. This is great for large groups of people who need to warm up! In a large pot, combine cocoa, sugar, and salt. Gradually stir in 5 C water. Bring to a boil, reduce heat. Whisk in the milk, cream, and remaining water. Heat through. REmoved from heat and stir in vanilla. Garnish with whipped cream and cinnamon.